I am so excited to host my very first giveaway! This one is courtesy of Tyndale House Publishers, who want to share the love (and books) with all of you! How awesome is that?! Entry form is below, but PLEASE read the rules. In this 30-day devotional based on his new book Appointments with Heaven, Reggie shares remarkable stories from the Bible and his life, showing us how we can face life’s heaviest burdens with courage and confidence, live without fear, and experience God’s miracles in our own lives. 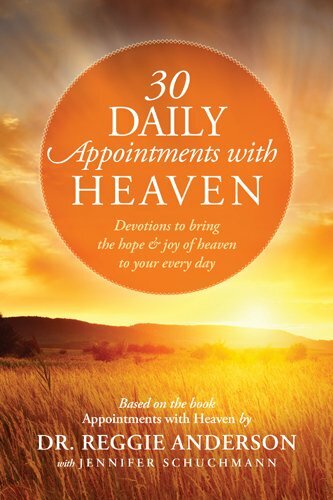 Soul-stirring and hope-filled, 30 Daily Appointments with Heaven will bring the joy and peace of heaven to your life today. Want a free eBook (PDF) copy of this book? Simply go to my review of Appointments With Heaven and share it via twitter or facebook. Then fill out the entry form below, letting me know how you shared in the comment section. eBooks will be sent via email. You MUST be a follower of this blog. Giveaway is courtesy of Tyndale House Publishers.